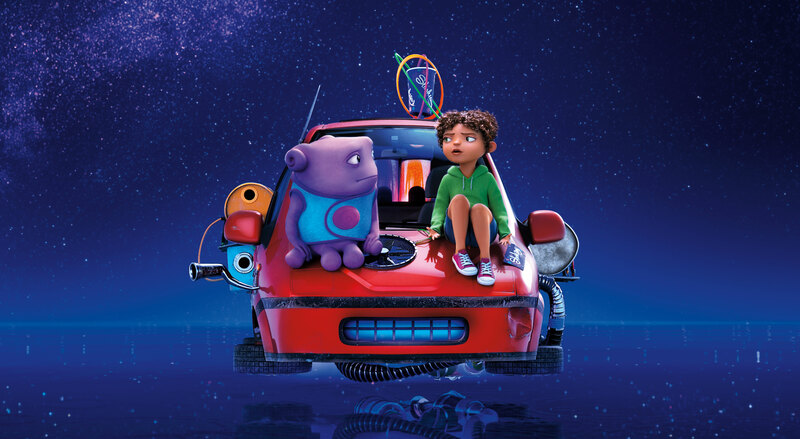 Dreamworks’ 2015 animated feature, Home, is a much better movie than it may look like at first glance. While that’s intended as a compliment, that first glance speaks so lowly of the movie that the end result, while a decent entertainment for children, ultimately still isn’t very much. The story centers on an alien race called the Boov – short, purple creatures with pudgy tentacles for legs – and their “friendly invasion” of the planet Earth. The Boov extract all the humans of Earth from their homes and places of origin, and relocate them to incredibly cramped neighborhoods with tiny houses, while the Boov enjoy the rest of the planet as their new home, as the cowardly creatures continue to run from another alien race called the Gorg, who are seemingly always in pursuit of the Boov. One such Boov is named Oh (Jim Parsons), who is clumsy, accident prone, and less of a conformist than the rest of his species. After Oh accidentally sends out a party invitation to every alien species in the galaxy, including the Gorg, he becomes a fugitive to his fellow Boov. His only hope is a young human girl named Tip (Rihanna), who managed to avoid the mass-abduction and is searching for her mom. Honestly, the story does have its charming moments, and some of the later scenes seem genuinely heartfelt. The animation is also lively and colorful, with the film’s best visuals being how Oh changes colors depending on how he’s feeling. Very young children will probably have some good fun watching Home, but it has a lot holding it back to make it not quite so appealing to older children or their parents. For many, Oh might come off as flat-out annoying. He does possess some fun attributes and has moments of humor, but Jim Parson’s vocals and the film’s writing make his act grow old fast (he speaks like the captions on those cat memes on the internet, which wears thin after a short while). Another problem comes with the movie’s soundtrack. I guess having Rihanna voice Tip (which makes the character sound considerably older than she should) also meant she had to do a number of songs on the soundtrack as well, which repeatedly play in the background, drowning out dialogue and usually not meshing very well with the scenes they play in. It’s hard to get invested in an emotional sequence when pop music is blaring in the background. Then there’s the plot itself, which feels incredibly safe and predictable, especially when one considers how sophisticated animated films have become in the last couple of decades. And the character development, when present at all, is quickly flooded over by hyperactive one-liners that aren’t all that funny. Not to mention that aforementioned soundtrack gets in the way of things far too often, and moments that could have given the film more emotional weight are instead simple montages to make way for more Rihanna. At the very least, Home is a harmless and inoffensive animated endeavor. But anyone other than the youngest tykes may prefer one of the countless superior animated offerings out there.